This past week my grandparents celebrated their 60th wedding anniversary. I am still in awe of this incredible milestone. I wanted to make them a beautiful card to celebrate and capture the significance of this day and I spent a lot of time thinking about and designing this card. I wanted it to be 'extra special'; this was not just any card, but one to commemorate such a special occasion. 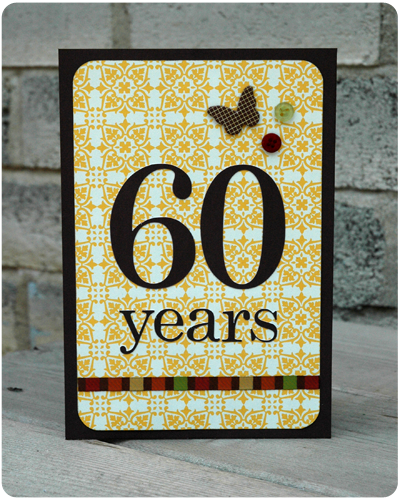 I often find myself a little worked up when it comes to designing cards for very special occasions. I feel they need to be 'above and beyond' to truly capture the significance of the event. Does this happen to you? They both had tears in their eyes. Our family had a wonderful time celebrating the two people who made it all possible through the commitment they made to each other so long ago. Congratulations on your 60th wedding anniversary Oma and Opa!